On September 13th the final-round auditions of the 1st International Chopin Competition on Period Instruments were completed. The jury, led by Artusz Szklener, awarded prizes and honorable mentions. The next competition will use harpsichords. Or how about an organ? Years ago I had the opportunity to attend an informal “house concert” here in Milwaukee featuring Ton Koopman on, of course, a splendid harpsichord. He played and talked about many things, often in response to questions some of which were as so often happens designed to elicit a hoped-for response, one which from time to time Koopman would deliberately confound: Landowska’s Pleyel harpsichord (which the questioner and other harpsichordists present all detested but which, he pointed out, must be considered an “authentic” instrument for the works written for her) and the probably misleading still photos taken of Landowska’s rather unusual claw-like hand position on the keyboard, which he surmised was posed to in part confuse and confound those who would attempt to copy it. Anyway…. One of his most interesting points, and one which he seemed to have spent some time thinking about, was the entire issue of just how long did it take for the harpsichord to be entirely replaced by the piano as an instrument for home music making? And he concluded that it took some time, well into the 19th century. Part of his evidence is the sheer number of nicely preserved harpsichords there still are. There is also the publishing convention, which again lasted well into Beethoven’s time, of publishing genuine piano music as for “… or harpsichord.” Some Beethoven sonatas for keyboared and violin were published that way. What the harpsichordist was to make of hairpin dynamics … well eventually they likely WOULD order a piano because the music was dictating it long before the harpsichord itself had become played-out from use. Anyway Koopman made the point that it is thus not unthinkable to imagine home music makers as playing Chopin, or at least certain Chopin, on a harpsichord. And although he was writing about the music itself, not the instruments used, Charles Rosen writes in The Classical Style that the Chopin Concertos were published with a continuo part — “this persistence of an old-fashioned notation” which as he further points out, creates actual textual challenges for the soloist: is it a note to be played, or a continue cue to be an unheard aid to performance? 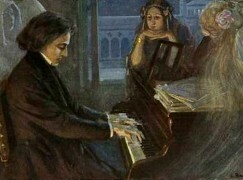 Chopin might never himself have played on a harpsichord, but it is likely he knew people who owned one and still played on it. Rosen posits that Chopin’s ornamentation and notions of sonata form were likely informed by being in Poland and thus surrounded by a world of music making that was not on the cutting edge of changes in style. It is not hard to imagine such a world as also not being on the cutting edge of changes in the “hardware” of music. One could make the point that the opening of the Raindrop prelude would sound even wetter on harpsichord for example. why would they, this music is neither composed for a harpsichord or organ. You knew that of course, hence your “funny” remark. But guess what, it is neither composed for a modern Steinway, Boesendorfer or Yamaha. Hats off to the 49 members of the Dutch “Orchestra of the 18th Century” for having the vision and courage to vote for and publicly announce their own personal winners of the 1st International Chopin Competition on Period Instruments in Warsaw, while masterfully accompanying the 6 finalists who performed Chopin concertos in the final round on historical pianos of their choice. Interestingly their votes differed significantly from those of the official jury. The orchestra’s manager Sieuwert Verster announced at the awards ceremony that the O18C would like to work with all of the finalist at some point but will start by inviting their two favorites, Aleksandra Świgut and Krzysztof Książek to perform next year with the orchestra. What a beautifully human and interestingly artistic gesture from the orchestra musicians, all of whom themselves know very well how highly subjective and debatable the results of competitions and auditions can sometimes be. Having won the admiration of these very experienced and highly competent orchestra musicians is certainly a valuable jewel in the crown of these young artists who otherwise came in 2nd and 3rd in the judgement of the official jury. Thanks for this very interesting further piece of information. By the way, I have recording of Ewa Pobłocka playing the concerto no. 2. It’s a very fine performance. Unfortunately, she never seems to play in London. In fact, her own website (http://www.poblocka.com) does not appear to list any forthcoming performances anywhere. 1. Genuine surprise: who knew that the Poles would lead the world in performing Chopin on period instruments? 2. Mock surprise: it was a foregone conclusion that the Poles would lead the world in performing Chopin on period instruments. 3. Mock surprise: the competition was rigged. Given the history of reporting on competitions on this blog, I’m guessing that 3 was intended. I suspect that 2 may be nearer the mark. Any music lover “of good will” who took the time to listen to the candidates would conclude that the performances of the finalists were all on a world class level. But it stands to reason that the most accomplished Polish pianists are very likely be among the world’s most interesting interpreters of their most beloved composer whose music, like no other, expresses the joyful yet tortured spirit of the Polish soul. It is no different with Argentinians for Tangos or Americans for Blues. Actually, I am not sure that Polish people should have a special facility for Chopin. While he was Polish, his music now is so well established internationally that it surely isn’t played more often in Poland than anywhere else where classical music is played. I think this goes for most of the core repertoire. If it was someone like Szymanowski, Lutosławski or Penderecki I would agree with you (since they are performed much more often in Poland than elsewhere), but not for Chopin. And he was the competition director, not a member of the jury. He may well be known as Artuś, which is one of many possible diminutive forms of Artur. If that is the case I think that Norman can be forgiven for confusing ś and sz. The confusion about Artur Szklener’s official function was caused by the moderator of the final evening of the competition introducing Artur Szlener, who was sitting in the same row as the jury, as the chairman of the jury and not as the chairman of the competition. See 9:40 in the following video. The final evening featured the 3 Polish candidates among the 6 finalists. If anyone has any doubts as to the depth of understanding these candidates have of Chopin’s music or the height of their musical prowess, they are invited to take the time to listen to and enjoy the rest of this video. It features not only world-class interpretations of Chopin on historical instruments but also an excellent level of sound quality and images. Enjoy and let’s be happy that such a new, interesting and long overdue musical event has been launched so auspiciously. Hopefully it will soon achieve the same heavy weight status that its big brother has enjoyed for decades. I wonder whether anybody else was surprised that in the final round five competitors played the op. 21 concerto, while only one played the op. 11, which is by far the more popular and generally considered the superior of the two. The instruments sound like the saloon pianos in Westerns like “Silverado” or “Tombstone”.